Owner-operated, California-style breakfast restaurant with a warm and friendly community atmosphere. Featuring fresh grilled breakfast and lunch prepared in an open kitchen. 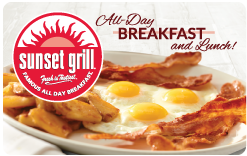 Sunset Grill is a proudly Canadian all-day breakfast restaurant franchise founded in Toronto, Ontario by Angelo Christou in 1985. The California-inspired concept was named after the Don Henley hit song, “Sunset Grill,” which reached top 10 of the Billboard Charts the year we opened our doors. We are a table service restaurant that appeals to all crowds, yet we remain very much 5-star inspired. Our food and preparation methods are centred around quality, which is never sacrificed. All our menu items are cooked fresh to order using healthy methods: flat-top grills, pat dry bacon, and nothing is ever deep fried. Fresh is Tastiest™ is our philosophy here at Sunset Grill – our guests are loyal to our brand and love our food because we use fresh ingredients, healthy cooking methods, deliver generous portions, and provide fast, friendly, and reliable service. With 80 franchised locations across Canada and growing, we are now positioned to expand across select markets in the United States, including California, Pennsylvania, and beyond. The chain will concentrate on high traffic and highly visible street locations in addition to freestanding pad sites and end caps with patio (where possible). Street units require 1,000 to 1,500 square feet with basement areas while pad units require approximately 2,200 square feet. Numerous prime locations still available in select US markets. Now expanding across Canada and select US and International markets. The franchise fee ($55,000 USD + applicable taxes) is paid upon signing and acceptance of the franchise agreement.